I haven't done an online swap in ages. When Erin asked me to join her strawberry pin cushion swap I knew it would be the perfect one. I purchased this pattern for the strawberries and was led to this adorable version for the flower tops from this website. I used wool felt for the flowers and adorned the center with french knots. Seed beads would be adorable as well! 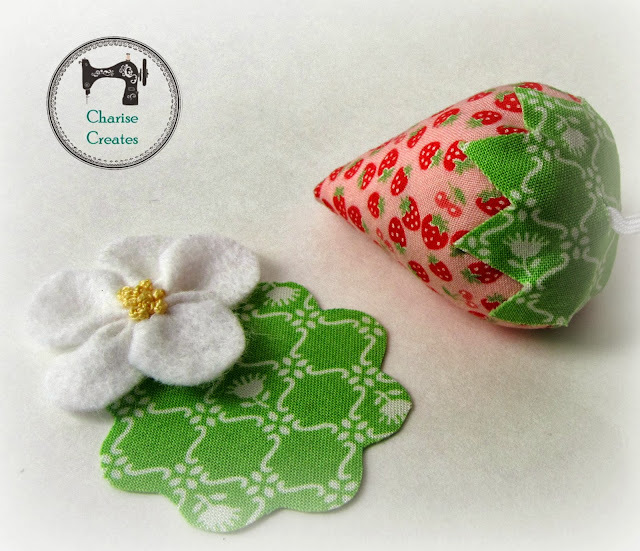 If you don't want to buy a pattern I found some great tutes to make strawberry pincushions and sachets. Country Living has a good one here. Martha Stewart has one here. The strawberry cap is make from two layers of fabric that I fused together using Pellon Wonder Under. I then cut our the shape and glued it to the top with fabric glue. You can also add a slip stitch or blanket stitch around the edges. The basket is from Anna at Noodlehead and is a wonderful and easy project! I'm going to make a bunch for fat quarters and "works in progress" for my sewing table! The strawberries and the baskets are fun, addictive projects and I can't wait to make more! Your work is always so inspiring Charise! Those strawberries are just SO cute! So gorgeous! I adore the fabrics you chose for these and the fabric leaves are lovely too. It's school holidays here so today I helped my little ones make some. Perfect project for kids! They loved the tiny bit of machine sewing they got to do and the magic of seeing the strawberry shape appear when they pulled the gathers at the top. These are the cutest. You never stop amazing me. 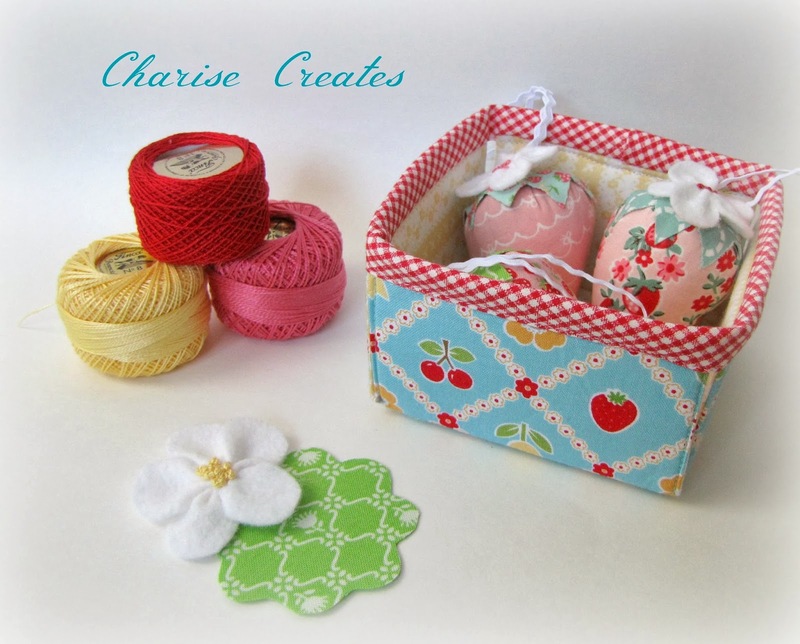 Have you seen the berry basket tutorial on Noodlehead? It's really sweet too. I just found your blog through the pincushion swap. Everything is beautiful! I'm off to browse…I'm your newest follower. So berry cute!!! I love your version of the berries and the adorable basket. Someone out there is super lucky to be receiving your pretty handmades! your gap in the basket seems smaller than noodlehead"s. did you do anything different?